An important milestone has now been achieved, with the Joint Strike Missile (JSM) passing the last of its planned tests in the missile qualification programme. The development phase of the JSM is now in its final stage and is scheduled for completion in autumn 2018. “This is very good news for the Norwegian Armed Forces and Norwegian industry. What is now remaining is the integration of the JSM on the F-35 in what is known as the Block-4 update”, says Program Director Morten Klever of the Ministry of Defence. This is scheduled to be completed in order to allow the JSM to be integrated and ready for the Norwegian F-35 when the system is fully operational. “The JSM is the world’s only fifth-generation missile with advanced capabilities which meet the operational needs of both the Norwegian Armed Forces and other nations, now and in the future. The most recent test in March this year was successful, and the development process is on schedule for completion by the end of the year”, says Geir Håøy, CEO of KONGSBERG. “The JSM programme and deliveries to the F-35 means significant value creation and technology development for KONGSBERG and our national and international suppliers and partners. Norway has a leading international position in long-range precision weapons, and has developed and strengthened its already close partnership with US industry through this programme”, says Håøy. The development of the JSM is in its final phase and is scheduled for completion with its Final Design Review (FDR), expected to take place in June. The integration of JSM in the aircraft is vital for Norway to be fully operational with the F-35 in 2025. The JSM will ensure that the Norwegian F-35 has a real combat capability towards any type of well-defended land- and naval targets. As a part of the development of the missile, a Legacy Flight Test Programme was carried out, during which a number of missiles were dropped in order to qualify the missile in preparation for integration with the F-35. Missiles have been released from an US Air Force F-16 aircraft at the Utah Test & Training Range as part of a test programme running between 2015 and 2018. The most recent tests were completed in March of this year, with the seeker and warhead implemented. The test was conducted on a land-based target, with a successful result. Once development is complete, the Norwegian Armed Forces will acquire a number of test missiles to be used for integration with the F-35 in what is known as the Block-4 update. 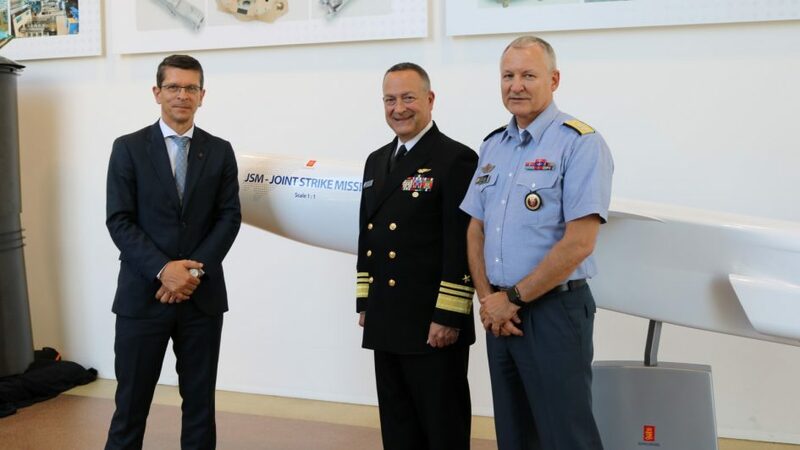 The integration of the JSM will be managed by the Joint Program Office (JPO) in cooperation with the main supplier, Lockheed Martin. Several of the nations that will be procuring F-35s have similar operational needs to Norway, and have shown considerable interest in the JSM. The Government considers it of great importance to continue and to develop the partnership between the Norwegian and US industry connected to the acquisition of new fighter aircrafts. In the long term, the goal of the industrial partnership is to ensure national value creation corresponding to the acquisition cost of the aircraft. Norwegian participation in the development phase of the F-35, has opened the opportunity for Norwegian industry to compete for production of parts and components, and thus so far resulted in contracts worth around NOK 4.1 billion. As production increases, there is a significant potential for new contracts with US industry. The Ministry of Defence considers it of great importance for both the Joint Strike Missile (JSM) and APEX (25-mm cannon ammunition) to be integrated on the F-35 in order to meet our operational needs, while it also opens up opportunities for Norwegian industry in the international market.